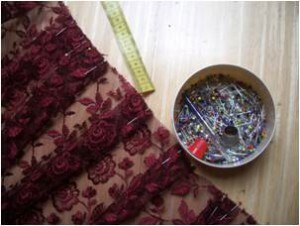 Making a Dress for a Jane Austen Ball. An Exhibition in Cooperation with Lucia. Being accomplished in sewing is most useful when you want to make a gown for a Regency ball. I score zero points in all kinds of needlework. 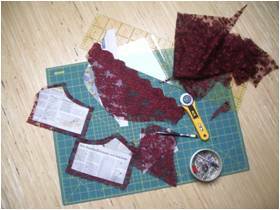 My approach to making a ball gown is to assemble it from clothes I find in my cupboard (you can see an earlier example here). These things can be turned into a dress fit for a character from a Jane Austen novel, right? Just create a high waist line with a ribbon, add braids or bows, and voilà: the modern clothes have become a demure morning dress or a gown for a genteel but chaste debutante. There won’t be much sewing involved, I hoped. 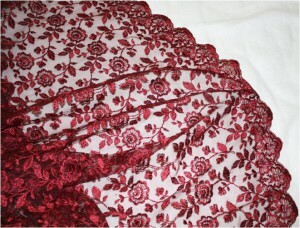 That was before I spotted the most ravishing dark-red lace on sale at an oriental drapery. Dazzled by a sudden vision of a glorious white and red Empire-style gown, I rushed into the shop and bought 3 meters of lace. 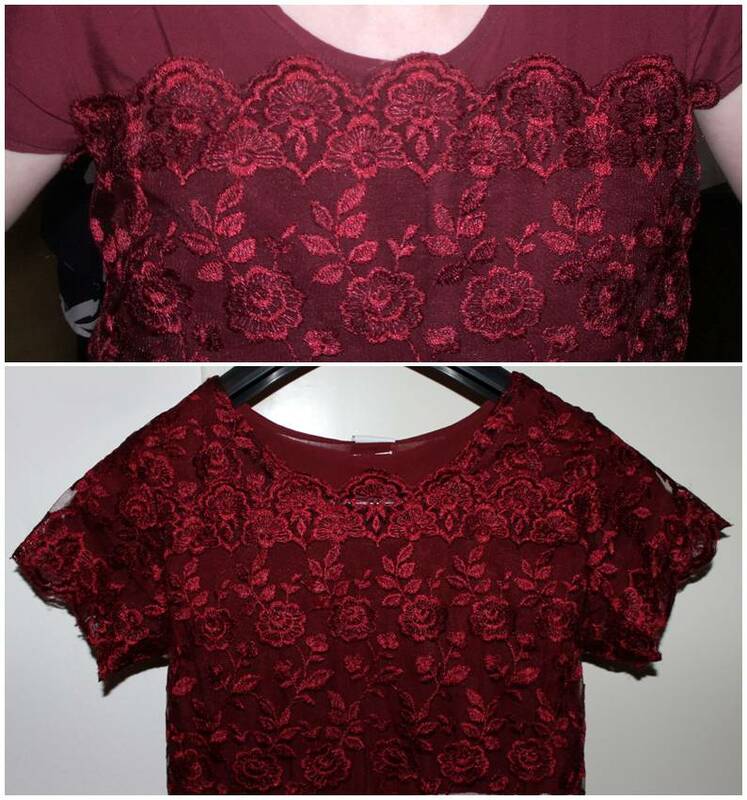 Problem: This lace meant serious sewing. Solution: Pick up the phone and dial the emergency number for sewing-dummies. 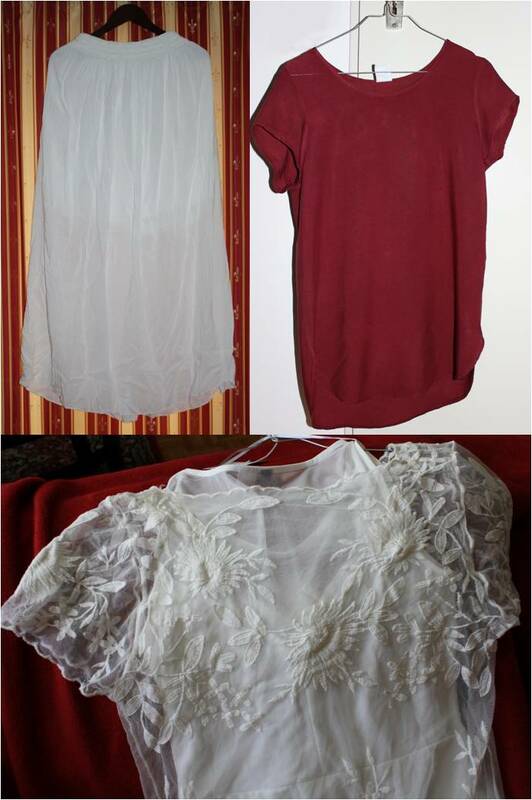 Lucia answered – my best friend and an enthusiastic needlewoman. I was delighted when Anna gave me a ring. I love sewing, and I always enjoy working with Anna. Together, we wanted to make the best out of her shopping spree. It looks quite convincing, don’t you think? sewing pattern that would match our needs. I concluded that I had have to create it myself. That was going to be a first! I stiched the cotton skirt to the shirt below the chest-line. The red lace is going to cover the t-shirt completely. I designed the sewing pattern and sketched it on a sheet of newspaper to transfer it to the lace. 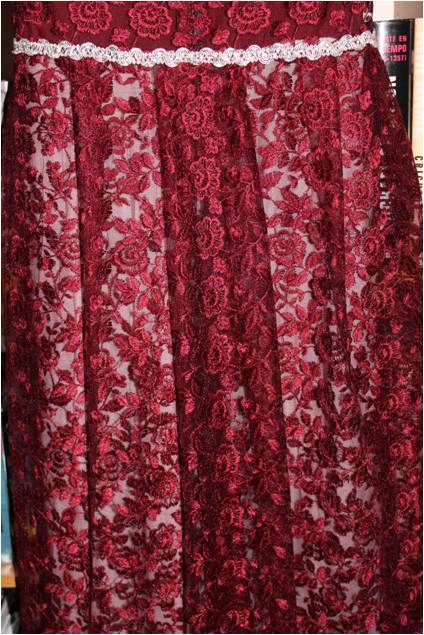 All in all, the gown is made of six pieces of lace. 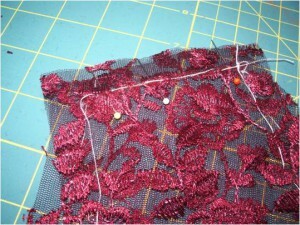 To get the lace in shape, I created folds of similar length. 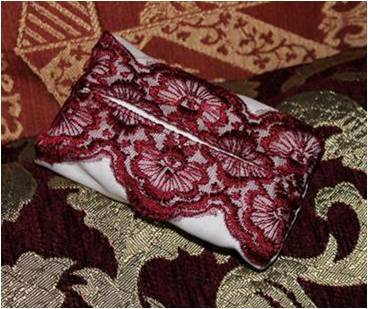 Neither pen nor chalk would stay on the lace. So I marked the seams with tacking thread. The lace has been stitched together. It starts to look like a dress! The pleated layer of lace and the silver braids are attached to the back of the dress. Luckily, Anna had bought 3 meters of lace. That was enough to cover the white skirt with two layers. A small placket at the front of the skirt emphasizes the white undergown. 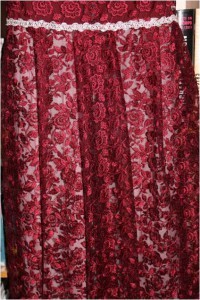 I attached the pleated lace to the back of the dress at waist height and adorned the waist line with silver braids. 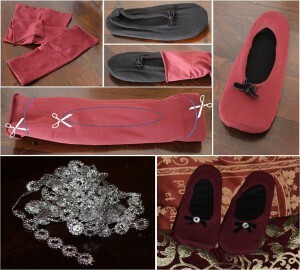 I sewed the braids to the pleated lace with transparent yarn as upper thread and red yarn as under thread. Tricky: I had better not make a mistake, as the yarn was “invisible” on the braids and the lace. Acting on my maxim to make everything from 21st century clothes, I bought black cotton shoes and tights (very high denier) in dark red at a supermarket. I cut the tights in pieces long enough to cover each shoe completely, put the shoe into it, cut out the middle part and stitched the red textile to the shoe. As the cotton shoes came with a little black ribbon, I simply had to adorn it with fake silver gems from a crafts store. You can click on the photo to enlarge it. Let’s check if we have a ball gown for a Jane Austen Ball, complete with shoes, fan, gloves and reticule. Have a look at the photos below (click on them to enlarge them). Lucia made the cute reticule from the remaining lace, silver braids and a discarded business shirt. 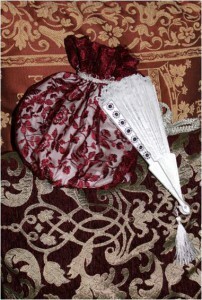 The reticule allows me to carry a fan, gloves, a handkerchief and even a small camera with me. Aside from the shoes, I was in charge of the fan. This is a cheap fan made of plastic and lace. To make it look more precious I covered the sticks with 3 layers of acrylic paint coloured “mother of pearl”. I also added some fake silver gems. This lovely little piece is a handkerchief box. Lucia made it from remains of lace and the discarded business shirt. It looks rather grand, more Caroline Bingley or Miss Grey than Lizzy Bennet. So I’d better come up with an appropriate role to match it. 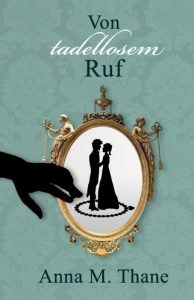 You can read here about methods to create a character for a ball (or a novel). 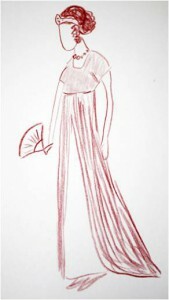 Lessons learned: You can make a ball gown based on 21st century clothes. But for the wow-effect you should add something historical-looking, such as lace. This means you need considerable sewing skills – or a really good friend to help you. Go to the main page of the Museum of Creativity.